We spent our first night in our new house last night. Kind of a campout situation since most of our belongings would not arrive until Saturday. We had packed Ethan, his playpen, Isaac, his napper, and for us, our soft, plush Queen-sized Air Mattress. A relaxing oasis to collapse into after a day of hard cleaning, signing papers, and scrubbing the walls. 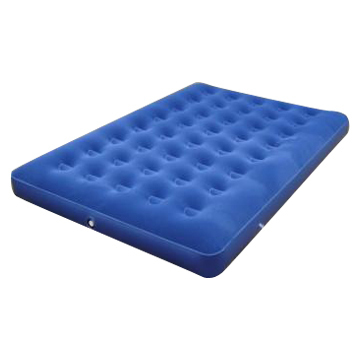 Only one problem, our air mattress sprung a leak…a big one. The sucker was flat in no time. So while the boys were resting sounding in their bedrooms on comfy little cots, Jennifer and I were basically sleeping on the floor. No cushion for aching muscles. No first night bliss. We got a cold, hard floor. Oh, by the way, we forgot to bring our blanket. So we had to snag two of the baby’s itty-bitty blankets that covered our shoulders. All in all, our first night in the new house was…stiff. ← WE OWN A HOUSE!!!!! Oh, the memories! We’ve done the same, but our mattress didn’t spring a leak. Hope your second night there is better.